Bezoek de Cu Chi-tunnels en de Mekong-delta tijdens een privétour van een volledige dag vanuit Ho Chi Minh-stad. Krijg inzicht in het dagelijks leven in de landelijke districten aan de monding van de Mekong rivier en ervaar Vietnam's oorlogsgeschiedenis. Inclusief privégids en voertuig, lunch, entreegeld en ophalen en inleveren van hotel. Begin uw dag met het ophalen van uw Ho Chi Minh City-hotel in de vroege ochtend. Neem plaats in uw privéklimaat met uw gids voor een rit van 60 kilometer naar de Cu Chi-tunnels. Bij aankomst, leer de achtergrond van de site tijdens het kijken naar een korte film over de tunnels. Volg dan je gids op de site om meer te weten te komen over het web van tunnels gegraven door de Vietcong-jagers en hoe ze bamboevallen, rijstpapier en rijstwijn hebben gemaakt. Ga verder naar My Tho om een ​​van de provincies van de Mekong Delta te ontdekken. Maak een boottocht op de bovenste Mekong rivier en observeer enkele gemeenschappelijke activiteiten in deze regio van Vietnam, die in veel opzichten van de rivier afhangt. Verken de kleinere waterwegen per roeiboot, langs landbouwgebieden met fruitboomgaarden, bijenteeltboerderijen en kokospalmen. Stop om honingthee, vers fruit en kokosnootsnoepjes te proeven en luister naar de volksmuziek van Zuid-Vietnam. Je tour eindigt met een terugkeer naar Ho Chi Minh City en breng je vroeg in de avond naar je hotel. Delightful day! Mai gave us a great overview of Vietnamese life on the Delta at Unicorn Island and also a the war at the Cu Chi Tunnels. We really enjoyed getting out of Saigon for the day to see the country. Great choice if you have limited time in Vietnam and want to see a lot! We had a fantastic day with Mai and our driver. They were friendly, and great with our sons aged 8 and 6. Mai was wonderful with the boys, she was knowledgable and fun. There was just the right mix of interesting historical and cultural information and facts and hands on activities for my sons and my husband and I. We would highly recommend the trip. Thank you for such an informative and fun day. This was truly money wasted! Our guide was a lovely and pleasant professional no doubt, but the language and communication was terrible! The guide was barely able to speak fluent English and for every question we asked/ request we made, the answer was Yyyyeessss! We paid premium amount for a private tour such as this also considering that we were stuck with the guide for the whole 10-11 hours and it was a thorough disappointment! Especially when we overheard some of the other guides explaining the history of the site and related stories, we were very very annoyed with the service provided by the local service provider - Halong Hanoi Transfer! The number they provided on their booking voucher was not reachable either. Basically, the Cu Chi tunnels site was just a walk thru with stops at photographic points and random snippets thrown in every now and then. The lunch was the worst experience of the whole day since we were taken to a random homestay option for lunch and the 10-12 minute walk through to here from the main road was packed with stray rabid looking dogs barking continuously at us! HORRIFYING! We were 2 vegetarian travelers in the group and the food was really below average and not even hot. It was a whole day 11 hour tour and hence even more upsetting that the food options were terrible also considering that there was no dearth of decent restaurants in the location. The positives were that the car was comfortable considering we spent close to 60 of the time in it on the tour and the guide and driver were both pleasant. However, having a more experienced and fluent English speaking guide would have made this so much a better experience! This private tour was great. We were met by our wonderful, friendly guide Thi at our hotel. Travelled to Cu Chi Tunnels in comfortable air conditioned van, with a good safe driver. Guided tour through tunnels. Thi was very informative, explaining lots of things along the way. After tunnels back in van to Mekong part of tour. Got dropped off at side of road to bicyclewe chose to walk into our lunch stop which was a home stay on the Mekong. Plenty of food and very nice. All included except if you wanted a cool drink or beer. After lunch onto a medium size boat for a cruise along the river. Stopped at a coconut lollie making facility to taste and learn how they are made. There was Plenty of chances to purchase souvenirs along the way and lots of toilet stops. Listened to some local singers while eating fresh fruit and drinking tea. Then onto small canoe type boat for a hand row along the water. Very quiet and relaxing. Back on big boat and then back to van. A very full interesting day with wonderful company in our guide Thi. Water bottles were provided throughout the trip. Both the driver and our guide were professional, courteous and helpful throughout the day. I would recommend this tour. Thanks Thi for a wonderful day out. 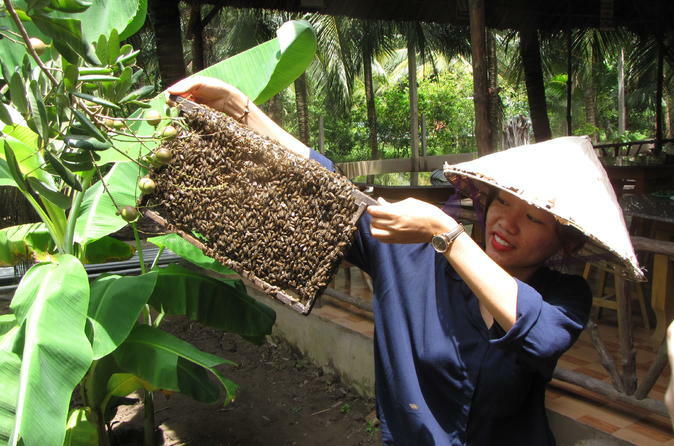 Great day tour, takes you out of Ho Chi Minh City. Only 4 of us in the group! The tour guide was very informative while visiting the Cu Chi tunnels. It is amazing how the tunnels were constructed and used. If you are able and not too claustrophobic, a crawl down a section of tunnel enlarged for tourists gives a good idea of what it must have been like using them during the war.After a delicious local fresh lunch, we spent some time in dugout on the Mekong Delta, wearing traditional Vietnamese straw hats. Visited several cottage industries - coconut processing plant and honey 'farm', well as little stalls with items for dale. Highly recommended! It was an amazing experience. They were very flexible and helpful due to our schedule change. It was great! Thank you so much! I booked this tour based on previous reviews and the fact we were to be transported in an air conditioned van or bus. This is a long day and it involved a lot of driving. The road between the Cu Chi tunnels and Mekong Delta is under maintenance and we had to endure long stretches of gravel roads. Our guide collected us promptly however we were transported in a Hyundai i10 with no airbags. The journey was cramped, minimal air conditioning and we felt extremely unsafe in such a small car. It was a most unpleasant experience particularly the trip between the tunnels and Mekong Delta. We promptly notified Viator of our safety concerns and the fact that they had misrepresented the mode of transport. Viator have failed to acknowledge our safety concerns and informed us that because we did not deny the service there was nothing that could be done. It's a bit hard to deny a service when you only have a day available for sightseeing. The tour guide was pleasant although failed to introduce herself at pick up. The tunnels were definitely worth a visit however it was very rushed. 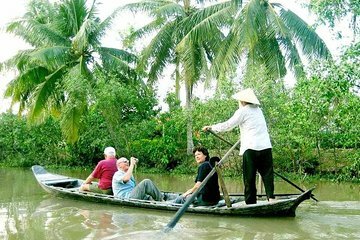 The visit to the Mekong Delta was okay. It's very commercial and not authentic. Give this tour a miss because Viator are not there to support you if anything goes wrong. The tunnels are a must though. Amazing trip and guide, the tunnels were a real eye opener you have to visit them.